In case you're rallying against the Atlantic Yards and Barclays Center developments in Brooklyn, this alteration to the original plans may or may not improve your opinion. 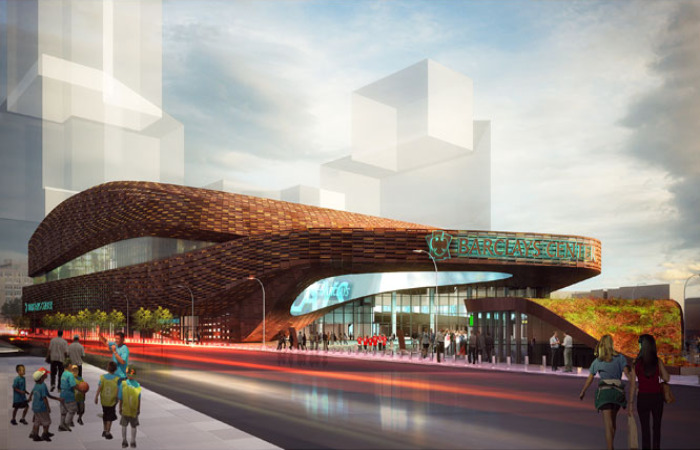 SHoP Architects, who are responsible for the design of the Net's new arena, have altered the entrance to include a public plaza with more environmentally-friendly landscaping and a green roofed entrance to the subway. SHoP altered the design to make the entrance more accessible and useful for the surrounding community and even designed it so it could be used as a farmer's market or event plaza. 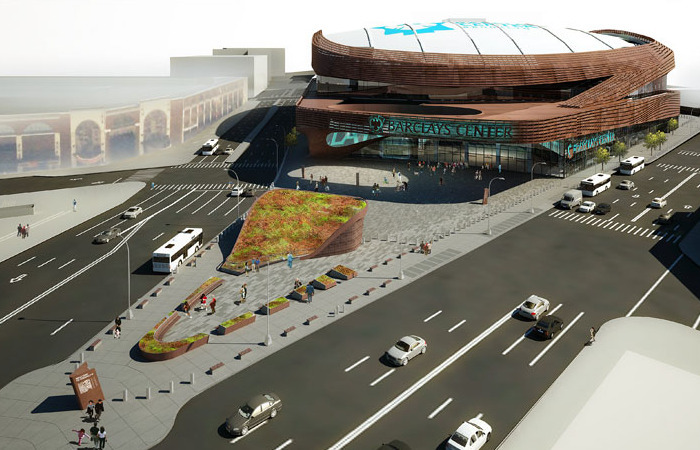 The Plaza in front of the Barclays Center for Atlantic Yards is located at the busy intersection of Flatbush and Atlantic Avenues, and it will serve as the main entrance to the arena. When designing the plaza, SHoP’s main focus was on creating a smooth, flowing area centered around transit and pedestrian traffic. The roof of the subway entrance will feature Sedum plantings that will compliment several other planters spread throughout the plaza. Seating around the plaza and planters will be made from Ipe wood. In addition to the green roof subway entrance, the updated plaza will feature a large covered area at the entrance of the arena with a giant oculus (read: hole in the roof), which will include a state-of-the-art display screen that can be programmed for games, events and other activities on the plaza. SHoP also considered how else the public space could be used to better serve the community — they designed it to be flexible and accommodating for community events, pop-up shops, fashion week events, and even a weekly farmer’s market. Currently, there is a lot of debate and contention regarding Atlantic Yards and the Barclays Center, and a small green roof and transit-oriented design don’t do a whole lot to reduce the footprint of the massive development. Is it a peace offering or a necessity to make the space work? In other news, that affordable housing the developers promised is supposedly not gonna happen. Hello, the Plaza at the entrance is beautiful. However i am a disabled person, my mode of transportation is Access A Ride. Will there be a designated Access A Ride drop off and pick up location for those of us that can only use New York City's Access A Ride? In all other venues around the city there are specific marked locations for this. This is extremely important as you can imagine to those of us who cannot use other types of transportation. SHoP Architect unveiled the new plans for the arena's entrance and public plaza on September 28th. The updated plaza includes a better transit oriented design, a green roofed subway entrance and a large covered area with a giant oculus. SHoP focused their design research on finding the best flow for pedestrians and entrances to the subway to ease traffic issues. Their design also focused on making the public plaza flexible for use by the community for public events like a farmer's market and pop-up shops. The Barclays Center at Atlantic Yards is not well-liked by area residents, who have been rallying against it since its inception. The addition of a green roofed subway entrance may make the plaza slightly more attractive but likely won't do much to ameliorate the surrounding neighborhood. SHoP's design for the plaza includes a green roofed subway entrance and planters and benches planted with Sedum. The covered plaza at the entrance of the arena will also include a state-of-the-art display set to show games, information and other media. The Main Concourse of the arena is glazed at the sidewalk level to ensure optimum accessibility and visibility into the arena in hopes of connecting it to the community and street level.